If it were that sunny here I’d NEVER be on the internet. So jealous. The dress is adorable! Getting back into creating always takes more time than you think, but once it becomes habit again you’ll be speeding along on projects. it’s cute!! i know what you mean about the internet.. it’s been sucking up my life lately. i have to remember to go outside more! Adorable dress. Seriously love it! I really need to learn how to sew. Not knowing is holding me back creatively! Also — of COURSE — I relate to you and social awkwardness. Cute! This is a good reminder to me to step away from the internet and do stuff. Sometimes it’s too easy to fall into the daily twitter chat and not get anything done. I can completely relate to the social interaction issues. I tend to communicate better through e-mails and Facebook than I do in person. It’s frustrating, but no matter how much I try to change, it’s simply who I am! Now that it is warmer and sunnier outside, I try to add things like “take a walk” or “ride bike to library” to my to-do list. If it isn’t crossed off at the end of the day, it bothers me, so I usually end up outside – and it’a always wonderful! i like the dress! where did you find the pattern? 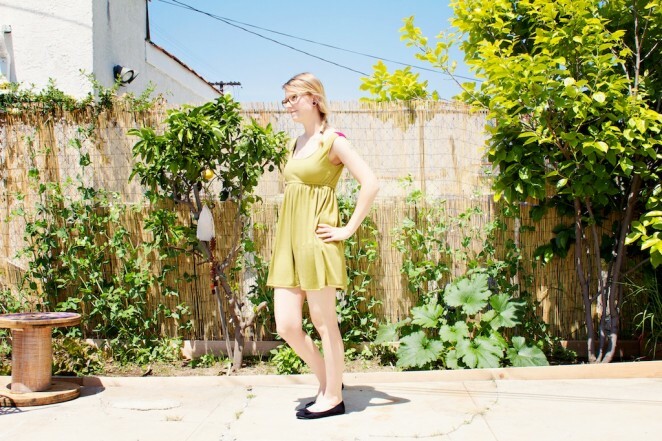 it looks like a great dress for the summer & a great project to get back into crafting. Looking great, Alix! I used to make my own clothes in my junior and senior years of high school and remember how satisfying that was. When you’re ready to write that post on introversion and shyness, I’ll be really fascinated to read it. I’m sure I’ll recognize some of myself in your words. Man, I totally understand. Sometimes I feel addicted to browsing. I’m glad you’re taking a break – Love your dress!